Chelsea manager, Antonio Conte, has said that he does not expect Alvaro Morata to be out for too long. 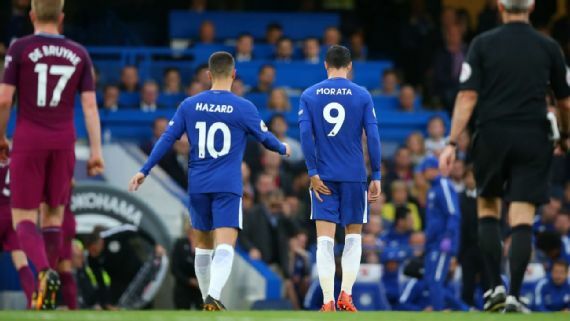 Morata was forced off during the first half of their 1-0 defeat to Manchester City on Saturday, holding his left hamstring. “It’s a muscular problem,” Conte told reporters afterwards. “I don’t think it’s a serious problem because he stopped before it will become a serious injury. “He said to me, ‘Coach, I prefer to stop myself otherwise I risk a bad injury’. I don’t know. “The doctor now in the next days has to check the situation, but I don’t think he’s available for the national team. “It’s normal when you play three massive games in only seven days, you must consider this aspect [fatigue].